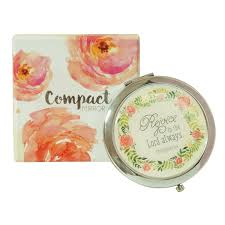 Compact Mirror comes in a sturdy gift box that is decorated with a spot varnished floral watercolor design and silver foil. 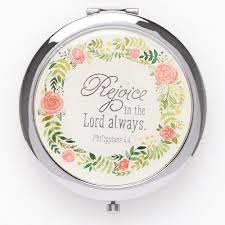 The hinged, gleaming polished chrome, two-sided compact has a plexi-shielded design insert on the front and a polished back. A simple thumb-button releases the catch to open. Has a standard and a 2x magnification mirror.